…because it’s winter again, and those wise sages who design sweaters have yet again chosen to deny you and I the opportunity to button or zip our cardigans. Why why why? Is there some desperate shortage of buttons somewhere? Are they being shipped off to help with a war effort that we’re not being told about? I for one would like to see the airship that’s being forged from mother of pearl, plastic, and balsa wood laminates. Either that, or the sweater factories are in cahoots with drug manufacturers. The correlation; if one catches more colds and flus wearing their garments open to the wild winter winds, one is more likely to purchase drugs to cure their ills. So nefarious, it’s almost believable. ANYWAY, I digress. 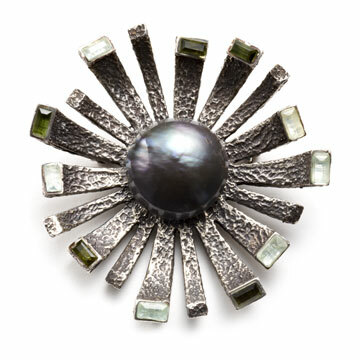 As a person who enjoys meeting these crucial fashion emergencies with grace and aplomb, I go for a large brooch to hold my garments together, thereby gaining the opportunity to express my joy of jewelry while thumbing my nose at Phizer and their ilk. I made these back in the late 90’s – yes, they are huge and in your face, like the decade itself; bold and overflowing with un-secured optimism. 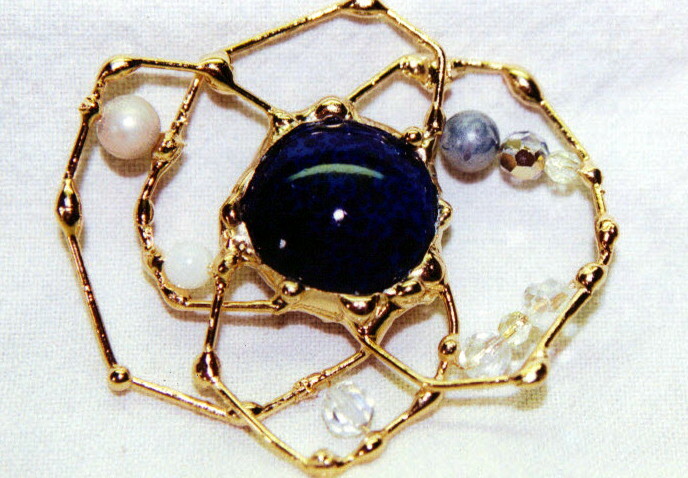 This one is aptly called “spider web in the morning” but it’s a bit too brightly plated for any self-respecting arachnid to want. That was not a good decision. I should always go with burnished metal…the bright stuff never did suit my style. So the next time you see a sweater that you like, even if it’s missing buttons, don’t fear. Just get one of these babies and you’ll be warm this winter, and hopefully free of cold and flu. Ew. 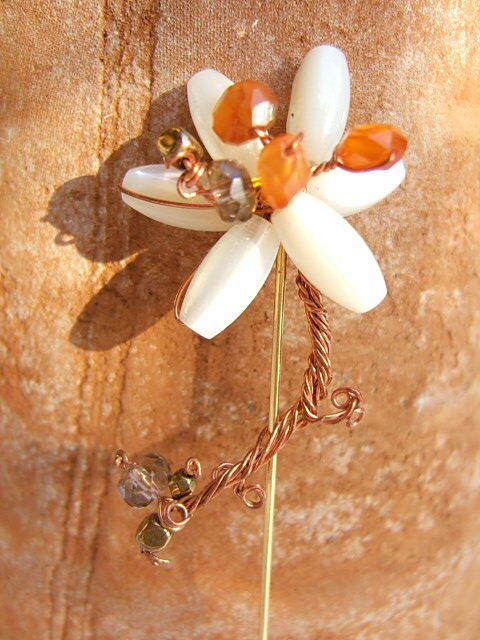 Smoky quartz and coral flower on stickpin: Mother of pearl and carnelian on stick pin. Designed by Chris Unruh, 2005. I don’t know anyone who at some point in their lives were not fascinated by miniature worlds; be they in the form of dollhouses, puppetering, or leggos and erector sets (the ultimate in miniturized building!). It’s also no wonder that so many of us adults still make it a point to go see the Christmas windows at Neimans / Macy’s / Barneys (pick your price bracket) which almost always are elaborately composed scenes created using smaller-scale dolls, mannequins, and papier-mache creatures of dream and nightmare. 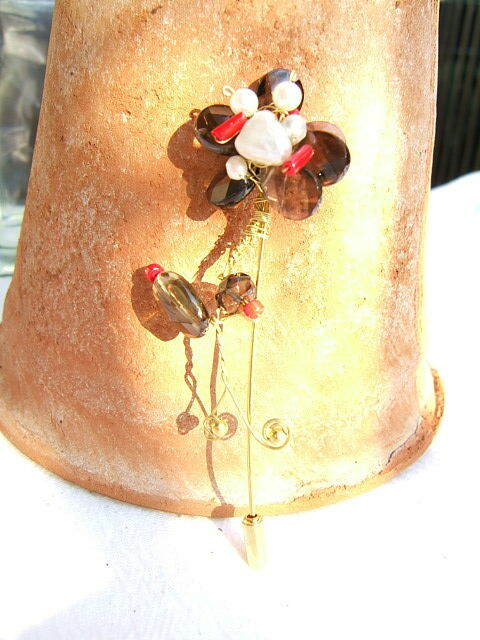 This creation was much smaller in reality than in this photo, lol! This little fish did okay for a while but I eventually returned her to the larger 20 gallon tank. She seemed dazed and confused before I did so – probably a lack of oxygen coupled with the tiny space freaked her out. Now, an example of doing it right: *This* is a great way of creating a true underwater environment in which no fish/shrimp/snails have been harmed – the wonderful marimo ball! Japanese myth hold that these little algae balls (which supposedly do continue to grow) bring good luck; as such, I need to get a hold of a LOT of these adorable green suckers. 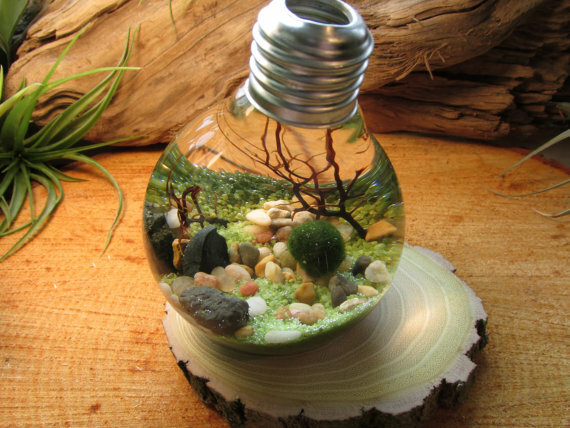 Don’t they look fantastic in these lightbulb vases? Again, genius! 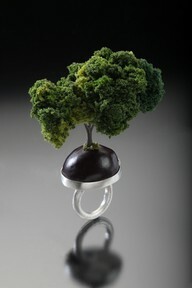 And then there’s this incredibly artistic tree perched on a ring; the ultimate in tiny worlds. 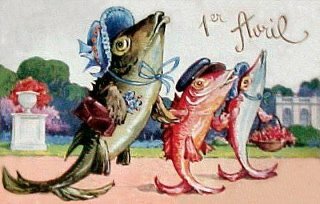 One Fish Two Fish is changing! As fish often do, we’re wiggling off the hook and diving back down into cool waters… only to emerge topside with a more appropriate name for this operation/adventure/avocation: Concrete Notions. Steve and I (two fishy folks if there ever were some) decided it better portrays what we are doing and makes for a more ‘solid’ brand (pardon the pun there). The best theme is peace. This is another ‘new to me’ band called Emma’s Revolution, featuring social justice themes woven into beautiful melodies and harmonies. Enjoy. I just found this fellow, Jon Fromer, and thoroughly fell in love with this tune. Talk about whirled peas, and a terrific voice to boot. I just love Michael Franti. His songs are so upbeat, positive, germain, and politically hopeful.